Discussion in 'Arts and Photography' started by TheMightyS, Sep 5, 2012. 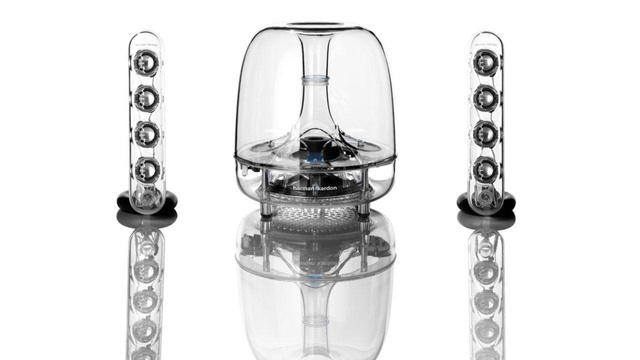 Ever since they first arrived in 2001, Harman Kardon's soundsticks always stuck a harmonious chord in balancing price, looks and performance. Designed by Jonny Ive himself, the first Soundsticks were inducted into MoMA's permanent collection. And now, they've gone wireless. For the most part, the speakers are the same: 10 watts in each satellite and 20 watts going into the subwoofer. But now it has Bluetooth baked in, and though that may not offer quite the same audio fidelity as a wired connection, it does mean a cleaner appearance for those more concerned with aesthetics. But that convenience comes at an added cost. Instead of the $200 pricetag of the Soundsticks III (which can be had even cheaper on the street), expect to pay $230.